Here’s another savory breakfast (or lunch, or snack…) recipe that’s easy to make ahead and save in individual containers for quick grab-and-go nutrition. 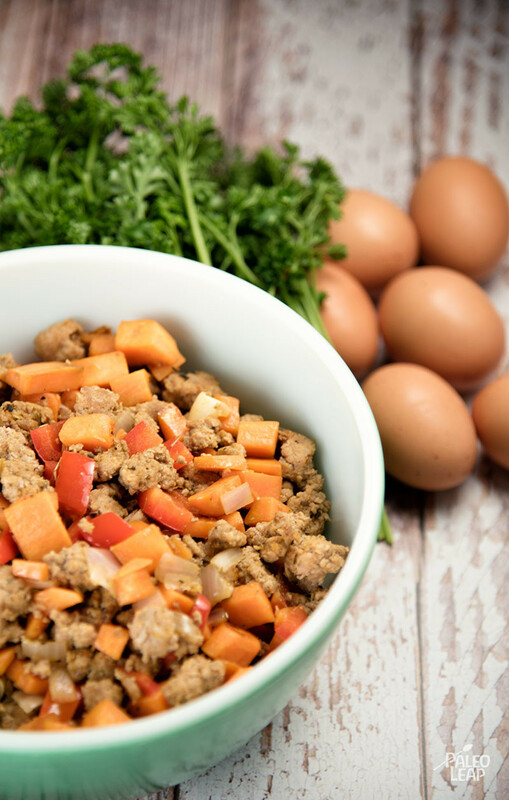 The combination of eggs and sausages is hearty and filling, and the sweet potatoes are perfect if you’re grabbing something on the run after a workout (for a lower-carb version, substitute winter squash or another favorite vegetable). 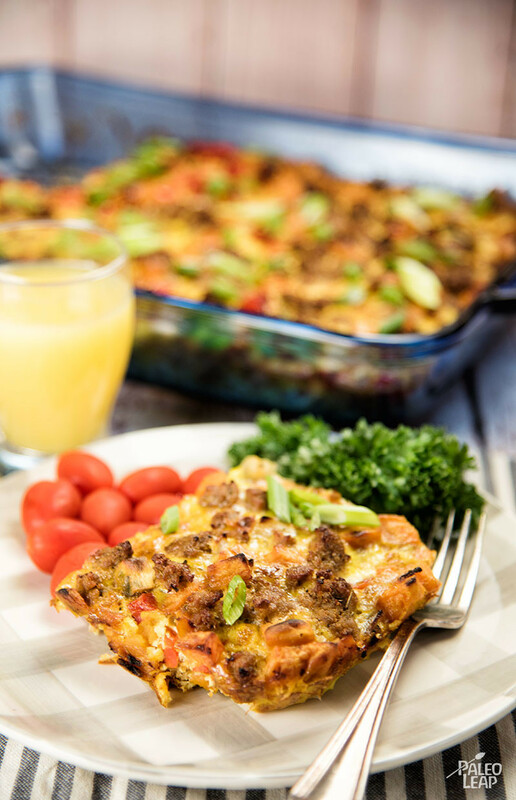 It doesn’t have to be just for workdays though; this would also make a tasty late breakfast on a weekend or day off when you don’t feel like cooking up a huge production. Throw some wilted spinach or fresh fruit salad onto your plate and you’ve got a low-fuss breakfast ready in no time. For the sausage, just make sure you’re buying a brand that doesn’t have any added junk – or you can make your own by mixing your favorite choice of meats and spices. And of course, you can always experiment with changing up the vegetables: that’s the magic of egg dishes! Try it, see how you like it, and then tweak it so it’s just right and you’ll end up with a reliable standby recipe to keep you going strong through those busy weekday mornings. SERVES: 4 PREP: 15 min. COOK: 30 min. Melt some cooking fat in a skillet placed over a medium-high heat. Add the sausages, and crumble while cooking. When the sausages are cooked, transfer them to a large bowl. Add the onion, garlic, and bell pepper to the same skillet, and cook for 4 to 5 minutes over a medium heat. Pour the vegetables into the bowl with the cooked sausages. Add the sweet potatoes to the skillet, season to taste, cover, and cook about 8 minutes. Mix the sweet potatoes into the bowl with the sausages and vegetables. Pour the sausage and sweet potato mixture in a baking dish. In a bowl, whisk together the eggs, almond milk, and season with salt and pepper to taste. Pour the egg mixture over the sausage mixture, and place in the oven. Bake for 20 minutes, and serve warm with green onions sprinkled on top.